The Dalite Cinema Contour 108 x 192" Fixed Frame Rear Projection Screen is another choice from Dalite when you need a simple but reliable and durable fixed frame screen and do not need or want a motorized setup. The Cinema Contour features a flat surface - perfect for today's video projections. 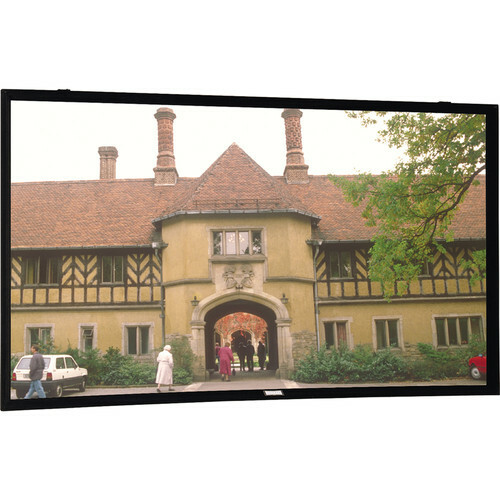 Available in sizes from 60 to 240", this screen has a 45° angle cut frame for a sleek, modern appearance. This is a no bells and whistles screen - just a simple rugged and well-designed screen for business, corporate, educational and general needs. Note: The frame is finished with a Pro-Trim finish - a fabric frame covering that aesthetically enhances the appearance of the installation while absorbing light that surrounds the viewing area.